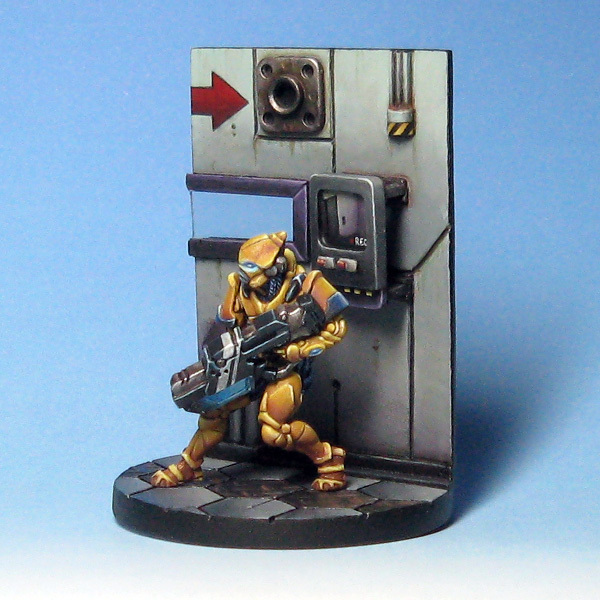 As a whole, I tend to be pretty old school when it comes to photographing miniatures – lots of light, and a traditional blue-to-white gradient background. 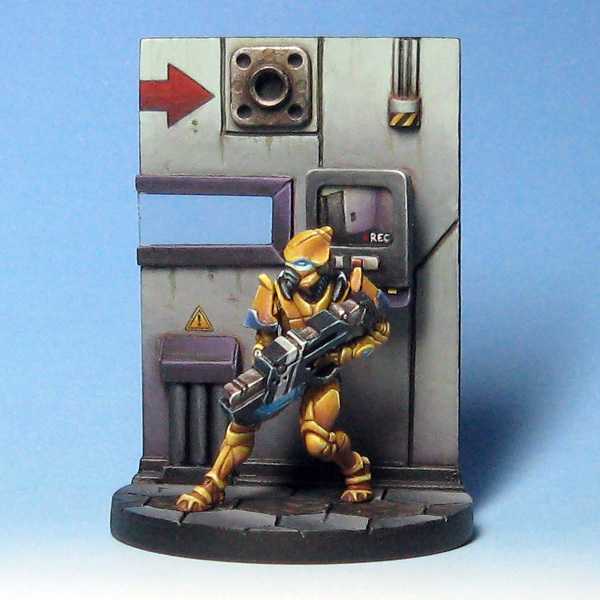 The gradient background seems to be pretty passée these days but I am always a little unsure about people’s motivation for the way they photograph their miniatures. For me, the intent is to give as realistic a photograph as possible with the limited photographic resources at my disposal. I want it to look as much like the model in hand as I can get it, so I try to get a good amount of light on anything I photograph from a number of different angles in an attempt to banish any shadows and let the painting do the work ie, the shadows you can see ‘should’ be those painted in by me. This is not an easy task, and I don’t often manage it 100%, but I do try my best. For some people (and this isn’t about anybody specific, just a general trend I have observed) it almost seems that the photograph has become a piece of art of its own accord – strong/directional lighting, black/photoshopped background. They get a lot of atmosphere into their models, but I am never quite sure they are entirely accurate reproductions of the actual miniature. I do believe there is a middle ground. Some set-up which allows the atmosphere to be conveyed whilst maintaining the integrity of the model. With this in mind, I decided to try to take some photos with my usual lighting but with a black t-shirt (thanks Toosh!) as a backdrop. Here are some pics for comparison. 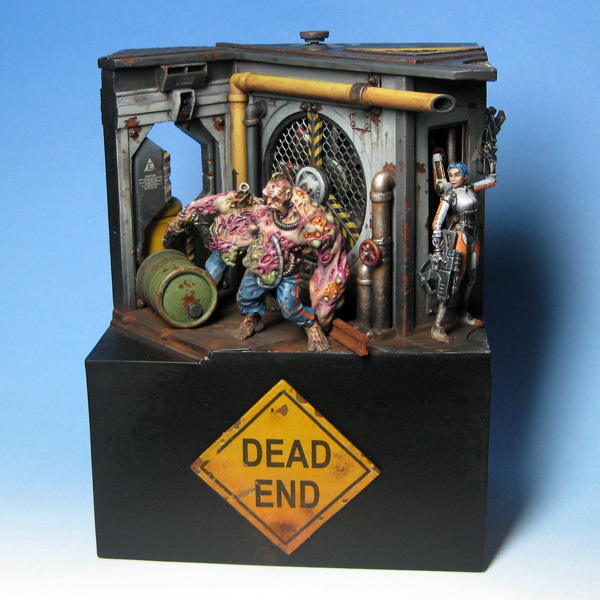 Here is the Domaru Butai I painted for the Crystal Brush. The blue background photos were taken before I left for Adepticon. The black shots I took today. I think there are a few tweaks that I need to do to stop the photos on the black background from getting overexposed, but I have just been reliably informed that having a small area of white (a square of crisp white paper for example) somewhere in the shot (and later cropped out) will help the camera with its white balance. I will most definitely try this next time.